The day after our arrival in Sao Paolo and after a short phase of the consideration that we are really in Brazil now we started with the organisation of our project: “Eden no Brasil! ” All our Brazilian contacts are informed again, scientists, NGOs, politicians, artists and friends. So, here we are, in search of support for our project. We are looking for information, conversations and impressions about GMO in Brazil and the brasilian way of life. First we can meet with representatives of Greenpeace Brasil in their Sao Paolo headquarter. Here we get a first impression of the situation around genetical modified plants (GMO) from a NGO-point of view and the strategic importance of the state of Parana in the GMO (resp. GMO-free) topic. We also get contacts and recommendations to realize the installation in Curitiba, the capital of Parana. In Curitiba we meet the director of Sanepar, the state environmental government of Parana. After an interesting and informative conversation we are directed to the food licensing authority of Parana, Claspar. Together with the communication department we figured out that the famous Oscar Niemeyer museum would be the best location for our installation. They try to arrange a meeting for us with the museum´s curator. Meanwhile we visit the harbour of Paranagua to get an impression of the situation (see description of the importance of the Paranagua port for GMO/GMO-free in the following blog). 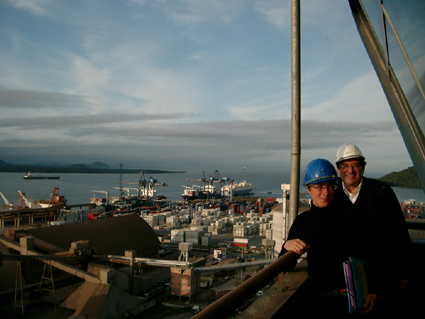 We have the possibility to speak with the managing director of the harbour as well as to visit the storage-silo and to see the loding of the grain. For us as Europeans it is quite impressive how things are being organised. Step by step we get a feeling of the brasilian way of life: Everybody knows somebody who helps, everything runs through personal contacts. We are inspired. Today was the meeting with the responsible of the Museumes and we have the approval for our installation and performances at the eye-shaped Oscar Niemeyer space. We have experienced so much support from friends and officials during the last days. Now, after two weeks of organisation, we can announce with full enthusiasm our “Eden no Brasil”-installation in the Niemeyer museum!